Carpenter Bees are even welcome! On the whole, I am a generous wildlife gardener. I am willing and even eager to share my garden with the wildlife that visits and lives in this garden. I've even opened my door to a wanderer or, too. Cute only works for a little while! But right now, I am thoroughly fed up with the resident chipmunks! My friends, they've crossed the line and made peaceful coexistence difficult. They ate every one of my Tommies. I kid you not. Every last one of the corms is gone. 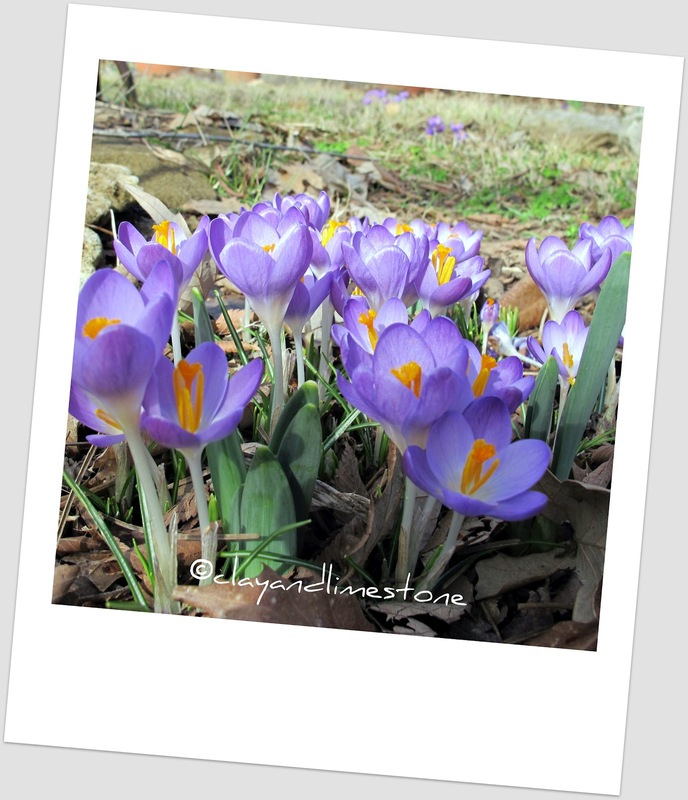 They were so lovely last spring and I was so sure that these squirrel proof, but, not chipmunk proof, crocus would finally make my Tommies On A Hillside dream come true! 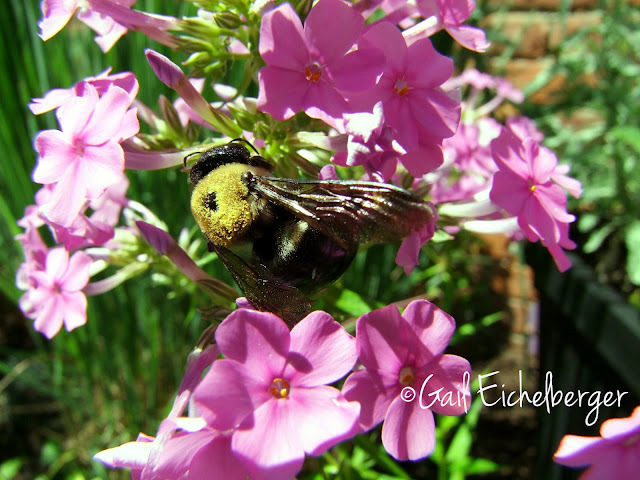 It's time to order spring blooming bulbs and I refuse to let the wildlife in my garden keep me from my dream! They're impossible to evict, but, I can make it darn hard for them to eat the bulbs after they bloom. I shall take a page from my friend Frances of Fairegarden fame. She has had pretty good success planting those especially tempting bulbs in sunken wire and rock! Critters be warned...you're going to have to look harder for your food! One, two, three, four, I declare chipmunk war. We saw one of your resident tommie munching chipmunks when touring your garden. I wish you the best of luck protecting your new bulbs. Confounded critters! Here's to success using the Fairegarden method! Oh those vandals, eating your Tommies! I hope the wire method works for you, dear Gail. The boxes I made of hardware cloth, with the edges *sewn* with thin wire might do the trick. I have a similar problem with voles in the Daylily Hill. Crocus are Katharine Hodgkins iris are particularly attractive to those devils! Good luck and thanks for the linkage, my friend. How heartbreaking! Frances won't stop 'til the problem is solved, so I'll bet her remedy, or one soon to come, works. Chipmunks, you have met your match! So glad you made those wonderful photos of the Tommies. I kept going back and looking at them. Good luck! They're E-vil....E-VIL!! You'd think that if something was squirrel-proof, it would also be chipmunk proof. Maybe I should blame chipmunks for the attacks on my Tommies. Chipmunks just look so darned cute, though. They are evil! Sorry that they are showing their face and true nature in your garden, too. I know, tell me about it! I'm waging that war, too. Always in the past it was the bunnies that were the bane of my existence, but the chippers are the real enemies this year--digging in my lawn and my potted plants. Nothing would stop them except spiky wires around the edges of the plants, and I wouldn't be surprised if they find a way over that, too. Good luck! They are all cute until they start eating my plants. Between the chipmunks and the voles I am having a real hard time peacefully coexisting with nature. They seem to have happily multiplied over the past year feasting on my plants and seeds. We now plant everything with wire otherwise we are just throwing money away with every plant purchase. Best of luck finding a happy solution. By the way that is a great shot of the chipmunk on the feeder. You should get a mean cat too, and don't feed it much. I personally have grown to dislike woodchucks (a formerly cute herbivore). They're eating machines, and way too capable of mowing down quantities of cilantro, squash, and whatever else that's not a solanaceous crop or a member of the onion family! I agree on getting a cat, they really do help, we have two and they do keep a lot of the smaller critters away. Your Peahen Posts still make me giggle. I was thinking of that recently when I was weeding near my little peahen ornament. Now, a chipmunk. I often ask, What is a Gardener/Animal lover to do? The price one pays for living with wildlife. I hate to say we don’t have a chipmunk issue in my gardens for fear of a jinx. So I will not say that. It looks like Frances has come to the rescue though. Our main evil varmints are the Voles! My cats and especially my dog deter the chipmunks around here although I do try to save a chipmunk when they catch one. Previously, chipmunks had eaten all my lillies when my then group of dogs and cats were too old to hunt them. Hope you find a solution for you pests! I don't mind sharing either - but I do mean share, not give all. After all, I have about 20 acres of delicious fields. Why do the rabbits need my lettuce and Brussels sprouts and all? Some o.k. All is not. Sounds like it's time for a terrier. I plant my tulips a foot deep - but with your clay soil, the idea would be enough to drive you straight to drink. Good luck with the chicken wire - know a few folks who've used it here with good results. Oh so not fair! Hope the chicken wire works. I am glad that we dont have those pesky critters here in Wales! Oh, man! I get frustrated with the rabbits. Like you, I wouldn't mind sharing, but the wildlife doesn't reciprocate. This morning, I planted some beets, carrots, and beans across the street, where the rabbits keep eating everything. They will probably eat these, too, but I am hoping by now they can find other things to eat. If I am really going to have a successful veggie garden there, the guy who owns the place needs to let us either limb up or cut down the walnut tree, and then, we need to put some fencing around to keep the rabbits out. I hope your barriers work so the chipmunks can't get to your bulbs. How annoying to get everything eaten! My neighbour puts a chicken wire mesh on the ground over bulbs to prevent this, and seems to work for him.